As we are constantly striving to improve our product design, we are proud to launch the 'Ceredigion Ark'. This model gives you more coop space, whilst not increasing the overall footprint of the ark. Based on customer feedback, we consider this an improvement on an age old design. The roof is vented and is constructed from solid 16mm shiplap instead of felt to avoid redmite infestation. 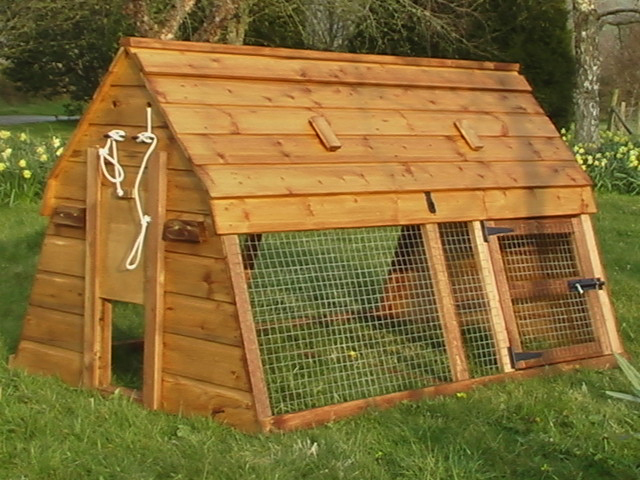 One side of the roosting area is easily detachable for cleaning. The 2 nest boxes are accessed through a door on the pine end. The roost has a floor area of 14ft sq . The ramp is raised and lowered using a rope that can be reached from the outside. The bottom run comes with a side door for easy access. External dimensions: Length 6', width 4'.